San Cristobal de las Casas and neighboring Tuxtla Gutierrez and Comitan are in the state of Chiapas, a region east of Oaxaca and south of Villahermosa and which is, without question, Mexico’s most stunning scenic area; mostly wild and rugged, it is rich in indigenous life and culture. 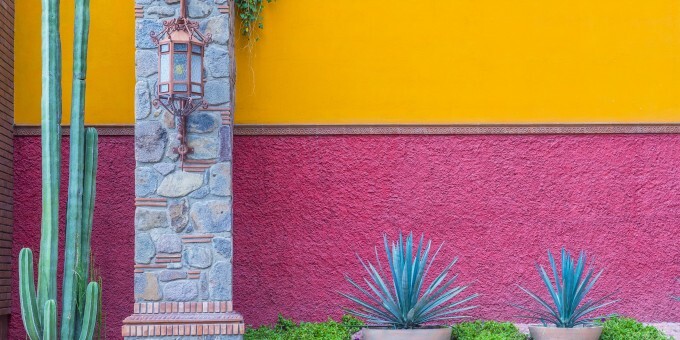 Chiapas’s thickly wooded jungles, mountains and valleys, together with its traditional cultures and indigenous roots have kept its look, feel and style very distinct from the rest of Mexico. Although there are some cities, symbols and events here which reveal the area’s colonial heritage, the population is still well established within its indigenous roots. Local people continue to live their lives here in accordance with certain customs and rituals. Many argue that the natural beauty of this area has no parallel in Mexico; deep green forested valleys, awesome waterfalls and high mountains with deep canyons and gorges, a colossal wealth of flora, fauna and wildlife and glorious lakes make this area one of Mexico’s most awesome natural habitats. Away from the larger towns, Spanish is a second language; local people have stayed true to their indigenous cultures and tongue. When you visit, you’ll see indigenous people going about their everyday life, often wearing their traditional dress. San Cristobal de las Casas (“Sahn-Kris-toh-bahl-de-lahs-cahsas”) was once the state capital of Chiapas, when the state was under Guatemalan rule; it may still have been but for its reluctance at first to join union with Mexico; in 1892 it fell out of favor with the powers of the day and the capital was moved to neighboring Tuxtla Gutierrez. San Cristobal de las Casas shares a similar history to that of indigenous Patzcuaro; deriving part of its name from Bartolome de la Casas, the bishop sent here by the Spaniards to rebuild bridges with the indigenous local population. Like Vasco de Quiroga in Patzcuaro, de las Casas endeared himself to the local population by promoting self-sufficiency and education. San Cristobal is characterized by its peaceful and welcoming atmosphere, coupled with an artistic and bohemian flair which attracts many European visitors, especially. The colonial streets and alleyways lined with red-roof tiles and white-washed walls beg wanderers to explore and discover the nooks and crannies; alleyways open up into picturesque arcades and plazas showing off their authentic colonial architecture and hosting churches, museums, cafés, restaurants and artisan workshops, among other delights. The city is situated at 7,000 feet above sea level, in a lush green valley where the air is fresh and you can experience that unique clarity of highland light. Although San Cristobal is the principal market town and commercial center in this area, it’s also the best hub from which to explore the surrounding indigenous villages and the magnificent natural beauty for which Chiapas is known. With easy access most commonly by road from the state’s capital city, Tuxtla Gutierrez, good local infrastructure and amenities, and surrounded by some of Mexico’s most breath-taking scenery and unspoiled natural wonders, it’s no surprise that San Cristobal is Chiapas’s top destination and hub for further exploration of this alluring region in southern Mexico. NB: Don’t miss the coffee! Chiapas is one of Mexico’s (and the world’s) premier coffee growing regions. If you like coffee, make sure you taste some local blends; they are organic, and exceptional. A Note About Photographs: Read the important photography rules and warnings in the Practical Information section below, which are especially relevant for the local villages surrounding San Cristobal. Plaza 31 de Marzo (the main plaza) lies near the center of the colonial city and is a main meeting point for locals and visitors alike. On the north side of the plaza is San Cristobal’s Cathedral, on the west side of the plaza are the Municipal buildings where you can also find the local tourist information office. Three blocks south is the Templo del Carmen with its archway crossing the road, once gateway to the city. Once you have seen the church you can go next door to the Instituto de Bellas Artes (Institute of Fine Arts), which offers art exhibitions and other art fairs from time to time. Considered San Cristobal’s most beautiful church, the Templo y Ex-Convento de Santo Domingo completed around 1560, is situated north of the main plaza on Avenida 20 de Noviembre. A further block south, you can visit the Tienda de los Artesanos de Chiapas (Chiapas’ Artisans Shop) where you can buy arts, crafts and textiles created locally, including replicas of the local dress worn by surrounding villagers. Meaning “House of the Jaguar” (Jaguars are Chipas’ ‘local mascot’) this elegant colonial mansion was most recently owned by a philanthropic couple from Switzerland, Gertrude Duby-Blom (who died in 1993), and her husband Frans Blom who died in 1963. After falling in love with Chiapas, they moved here and spent the rest of their lives exploring, surveying and studying the local indigenous societies and ecology, as well as educating and protecting the its peoples. Today the house is packed full of their work including photographs, archaeological finds and books. No-Bolom is also a guest house and offers tours and investigatory expeditions of the local area. The tours are aimed at people who want to learn about the place and the people they are visiting. If you would like to experience life within a Lacandon community and learn how they make their bow and arrows or listen to their stories of old, book a trip with Na Bolom. Groups are kept purposefully small: 8 people maximum. Over the last 50 years Na Bolom has developed a trust and friendship with the Lacandon people that you won’t find with anyone else. San Cristobal has a selection of fine museums. Museo del Ambar de Chiapas (Amber Museum) is situated at the Ex-Convento de la Merced and displays a selection of Amber; Chiapas Amber is known for its purity and clarity. Museo de Trajes Regionales (Regional Costumes Museum) needs an appointment to be seen; but if local costumes and dress interest you, this is a must see private collection of exhibits. Museo de Culturas Populares (Popular Cultures Museum) houses temporary exhibits and photographs. Cafe Museo – Chiapas is one of Mexico’s – and the world’s – premier coffee growing regions; and this cafe-museum is run by Coopcafe, a group of small-scale growers in Chiapas. The museum provides a history of coffee and coffee-growing; and the cafe offers the opportunity to taste the genuine article – pure, delicious organic Chiapas coffee. Don’t miss it! Although this is closer to Tuxtla Gutierrez, Cañon de Sumidero is easily experienced as a day trip from San Cristobal. This spectacular canyon created by the Rio Grijalva; following the completion of the hydro-electric dam here in 1981, the area has now become a massive reservoir. You can now read our Complete Guide to the spectacular Sumidero Canyon & Sumidero Eco Park now open inside the canyon. Due it natural diversity, rich, fertile lands and eye popping topography, Chiapas is unsurprisingly one of the principal areas in Mexico for Eco and Adventure tourism. San Cristobal is one of the best areas in Mexico to enjoy eco and adventure travel and there are various operators who can help you to enjoy a spectacular outdoor travel experience in the region. You may want to consider an organized tour to experience these villages situated around San Cristobal de las Casas. On the highway between here and San Cristobal de las Casas is Amatenango del Valle: A hamlet that is famous for its local potters and pottery. The pottery here is still fired in the traditional way: by building a wood fire around the pieces and not in a kiln. Make sure you stop and see the array of pottery, and more recently, “animalitos” (little animals) on offer (although some of the animal pieces can be quite large, too). Prices are very affordable by western standards; some pieces are fragile, but they will wrap them carefully for you. Be sure to stop and buy. See Also: Picture Gallery for Amatenango del Valle. Just over an hour away by road from San Cristobal, this village is famous for its embroidery. The embroidery you’ll see being sold in San Cristobal all comes from here. On Thursdays to Sundays the market sets up here, and you can find some of the finest quality woven textile in the region. It’s not inexpensive, and the quality is superb. If you are going to visit the local villages of San Juan Chamula and Zinacatan (see mini guides, above) it’s best to hire the services of a local guide. This is because these communities are distinct: they have customs and practices which will make little sense to an outsider without the explanations of someone with local knowledge of society and culture in the vilages. By Air – About 10 miles outside of San Cristobal is a small airport with flights to and fromMexico City, although it has been closed in recent years and the mountain climate, particularly fog, often prevent flights from taking off and landing, especially in the winter months. If you want to come from/go to San Cristobal you may be better off traveling by air from nearby Tuxtla Gutierrez. , a 90 minute road journey from San Cristobal. Connect to the Mexperience Travel Center for Airlines. By Bus – Regular long distance buses make the journey from Mexico City to Tuxtla Gutierrez daily; the journey takes around 15 hours and San Cristobal is a further hour-and-a-half from Tuxtla Gutierrez. The road between Tuxtla Gutierrez and San Cristobal is absolutely stunning. Regional buses also travel daily and frequently from Villahermosa, Campeche, and Merida to and from San Cristobal de las Casas. For detailed information about bus transportation read the Mexperience guide to Bus Travel in Mexico. By Car – There are now fast roads connecting this region to Merida, Cancun, Oaxaca, Mexico City. The drive is a long one from Mexico City, but you’ll be rewarded by some stunning scenery. Most people tend to fly to the region to Tuxtla Gutierrez) and rent a car locally or use regional buses to get around (see buses, above). Flying to the region is a more sensible options unless you have a specific reason for driving to Chiapas. See additional information about Driving in Mexico and Mexico’s Toll Roads on Mexperience. Local Buses – Local buses are available to take you around town and are very inexpensive. Most of San Cristobal is accessible on foot. There are various religious festivals and celebrations, which always give an insight into the local indigenous life of this region. Carnaval at Chamula. One of the biggest annual events takes place in Chamula, a nearby village, in the days leading up to Lent; it mixes Christian and Maya ceremonies. The Feria de Primavera. (Spring Fair) happens during and after Easter week, and is one of the busiest times in San Cristobal; festival highlights include artistic presentations, culinary demonstrations, bullfights, amusement rides, and the parade of the Festival Queens. Book early if you plan to visit San Cristobal during this period. The Fiesta de San Cristobal. Around the end of July, this festival celebrates the city’s Patron Saint (St Christopher) with celebrations, processions and an all-night vigil. Exchanging Currency: Banks with ATM machines can be found in the downtown area of San Cristobal de las Casas. During business hours, they and the Casas de Cambio will buy traveler’s cheques and cash from you as well. For detailed information about exchanging and managing your money, read the Mexperience guide to Money in Mexico. Military Checkpoints: Expect to pass through at least one, but probably several of these on your road trip through Chiapas. Don’t be alarmed, the soldiers may or may not check your car’s trunk; they are polite, respectful and can even provide local advice and directions if you need it. See Also: Military Checkpoints in Mexico. Los Barrios – On Guadalupe Victoria #25, this restaurant serves good, contemporary and traditional Mexican food. Eden – On Avenida 5 de Febrero #19, this is a small, intimate restaurant serving excellent food from an international a-la-carte menu. La Casa del Pan Papalotl – On Real de Guadalupe #55, this restaurant is known for its excellent vegetarian food dishes with the foods they serve grown locally. Pierre – On Real de Guadalupe #73. For something different, try French food in the Mexican highlands of Chiapas! This restaurant is owned and run by local French expat. San Cristobal de las Casas has a good selection of cafes, restaurants and bars. Night life is not wild, but people do stay out late drinking and socializing in the town’s bars and restaurants. San Cristobal is an excellent place to buy locally-produced arts and crafts, as well as jewelry and textiles. Casa de las Artesanias, on Av. Niños Heroes, stocks samples of every craft practised in the state of Chiapas. Sna Jolobil (meaning ‘weaver’s house’) on Av. Lazaro Cardenas, is a co-operative of textile weavers. Quality and prices are high and the work they create is beautiful. Lagrimas de la Selva, on Av. Hidalgo, sells locally produced jewelry, crafted princiappyl from local stones, particularly amber. 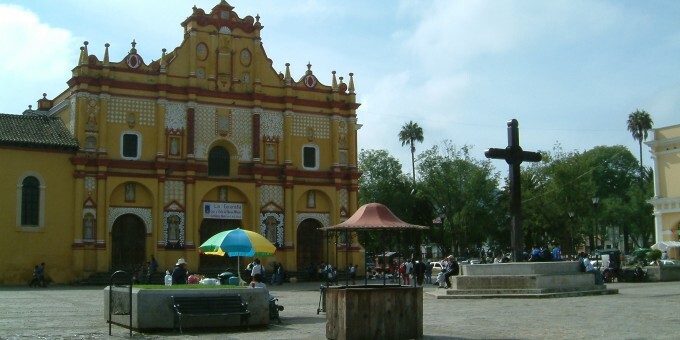 San Cristobal de las Casas is a town situated in the mountains of Chiapas. The high altitude and mountainous terrain make the climate in this area varied. It can get quite warm in the summer and cold in the winter. Rains can come at any time, but you will also need to pack protective cream and a hat to guard against the sun. When you pack for Chiapas, pack clothes for all weathers; in the winter months you will need to ensure you pack a stock of warm and waterproof clothes.